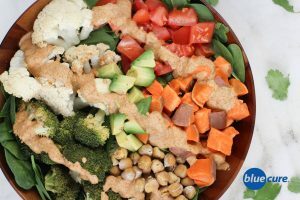 Roasted vegetables, creamy buffalo dressing, crunchy chickpeas served on a bed of greens. This buffalo buddha bowl is a packed with flavor and nutrition that’s sure to leave you satisfied! Check out the nutritional benefits for chickpeas, sweet potatoes, tomatoes, and broccoli in our nutrition guides. Preheat the oven to 400F. Wash the veggies. Chop the sweet potato and the cauliflower. Place on a baking sheet. Roast for 25-30 minutes or until desired texture. Place the chickpeas on another baking sheet with edges. Bake for 30-40 minutes, or until desired texture. Stir often to avoid burning. In a high speed blender, combine all the dressing ingredients. Blend until smooth. Add more water as needed for thinning. Optional to add more cayenne pepper to make it spicier. In bowls, add at least 2 cups of greens, then layer on the sweet potato, cauliflower, chickpeas. Add avocado slices, if desired and any other veggies of choice. Drizzle the buffalo dressing on top and enjoy!